YEREVAN, April 16. /ARKA/. Foreign ministers of Armenia, Azerbaijan and Russia Zohrab Mnatsakanyan, Elmar Mammadyarov, Sergey Lavrov, as well as the OSCE Minsk Group co-chairs Igor Popov (Russia), Stefan Visconti (France), Andrew Schofer (USA) made a statement following their meeting in Moscow today, the Armenian Ministry of Foreign Affairs said. The statement says that the participants of the Moscow meeting discussed the situation on the border between Armenia and Azerbaijan and on the line of contact between Azerbaijani and Nagorno-Karabakh troops, as well as the prospects of cooperation in the humanitarian area. They also had a thorough exchange of thoughts on fundamental issues of the conflict settlement. 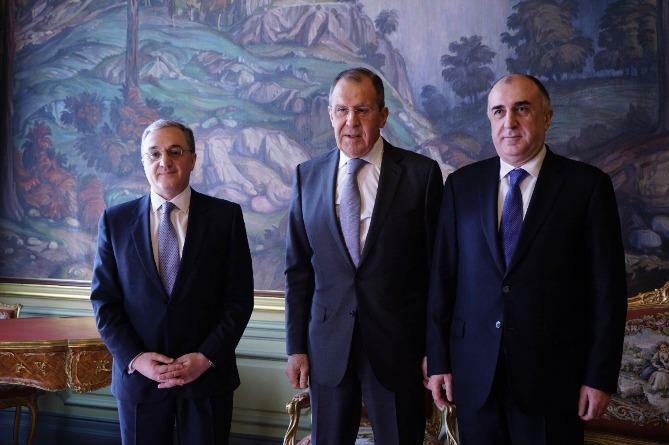 The statement says that Armenian and Azerbaijani foreign ministers reconfirmed the intentions of the parties to continue their efforts for the settlement of the Nagorno-Karabakh conflict through political and diplomatic means. It said discussions focused on further stabilization of the situation in the conflict zone, particularly during the agricultural work period. They also agreed to take measures on the basis of reciprocity to allow visits of relatives of detainees on the territories of the parties. The ministers expressed readiness to take practical measures to establish contacts between people, including through mutual visits of mass media representatives. The Russian Foreign Minister and the OSCE Minsk Group Co-Chairs reaffirmed their commitment to the mediation mission aimed at establishing a stable peace in the region. The meeting participants agreed to continue contacts in the near future.